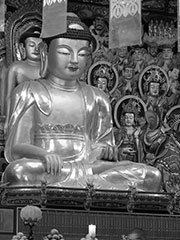 Cheontae is the Korean descendant of the Chinese Buddhist sect Tiantai. Tiantai was introduced to Korea a couple of times during earlier periods, but was not firmly established until the time of Uicheon (1055-1101) who established Cheontae in Goryeo as an independent sect. Due to Uicheon’s influence, it came to be a major force in the world of Goryeo Buddhism. After he returned from Song China in 1086, Uicheon sought to ease conflict between the doctrinal Gyo (教) schools and Seon (禪) schools, believing that the Cheontae doctrine would be effective to this end. Cheontae would eventually die out in Korea, its teachings being absorbed into the Jogye Seon tradition.